When working with sample-based media, a performer is managing timelines, loop points, sample parameters and effects parameters. The Slidepipe is a performance controller that gives the artist a visually simple way to work with their material. Its design is modular and lightweight, so it can be easily transported and quickly assembled. Also, its large stature magnifies the gestures associated with its play, providing a more convincing performance. Lake (21'48" | 29.9Mb) performed at Placard Music Festival, July 2003. The Slidepipe: A Timeline-Based Controller for Real-Time Sample Manipulation , presented at NIME'04 Japan. The Slidepipe came out of several improvisational music sessions, where the computer keyboard and trackpad were the control sources. After experimenting with the customized performance software important gestures were noted and sketched, and predictions were made as to how the total gestures could be reduced to three or four main movements. Inspiration for the design of the device also came from the type of content to be worked with. A motivating idea was that this would be a controller for resampling bluegrass and country music. Folk musicians tended to fashion their own instruments out of whatever they had around them. This provided a unique design and sound for an instrument that was native to the artist who created it. Imagine sitting on a front-porch of your country house creating noise scapes from the pastoral folk music. These factors motivated the design towards something that looked ragged and thrown together, which was the form of the original Slidepipe. This initial version of the controller made a couple performances, but with time it was disassembled, moved, and reassembled it lost functionality and began to wear quickly. Plus, the materials used in it's construction were unecessarily heavy. The redesign would have to hang on to the good functionality of the original, but make improvements on the 'gig-ability', the durability of the materials and the ease of breakdown-setup. This was the design criteria for the freshest iteration of The Slidepipe. The Slidepipe uses a horizontal pipe as it's metaphor for a timeline. Each pipe is comprised of two pipeheads and two paddles and two ropes. Each pipehead contains circuitry for reading the parameter state of the ropes and the paddles, as well as a mechanism for managing each ropes position. Each side of The Slidepipe is connected to a master device that takes all the sensor data and formats it for the software. Three pedals also connect to the master device to provide extra functionality to the performance of the software. The master device then transmits the information to the host computer that is controlling the sound. Before playing The Slidepipe the performer would have to be well-aquainted with the software that it will be controlling. The Slidepipe is developed as a general performance controller, so it could control almost any flavor of media (video, sound, robotics, etc). However, it was developed with a particular style of play in mind. Each pipe is a timeline, so it represents the time length of a sample. The two paddles represent the loop-in and loop-out points of the sample, so by moving the paddles along the horizontal pipe you are affecting what sound from the sample is being heard. If the paddles are close together, then you are only hearing a quickly-looping small amount from the sample and if the paddles are as far away from each other as possible, then you'd be hearing the entire sample being looped. Once you have the loop that you want to work with, the ropes are used to manipulate the parameters of the sound. Parameters are assigned in the software, and can be things like volume and pan for sound, or opacity or playback rate for video. In addition, by utilizing the pedals, these ropes could have multiple functionality. If the pedal is pressed then the ropes can become mapped to the parameters of effects such as delay, granular synthesis, arithmetic operations, feedback, etc. The pedals can also have dual functions. If the pedal is pressed and held, then it changes the mapping of the ropes. If it is tapped then it changes the sample source that you're working with. This allows the performer to step through a score or a list of preselected clips that they want to work with. Mastering The Slidepipe is not easy, but with practice and patience you too can be a virtuoso Slidepipe performer!! The old Slidepipe design contained many technical flaws that added unwanted circuit noise and latency to the performance of the instrument. The sensor lines ran six feet to the analog-digital conversion (ADC) circuitry, along with some of the power lines that fed the circuitry on the pipeheads. This distance and poor wiring method added noise to the circuit. Also, these lines weren't filtered or decoupled, so the sensor values had lots of bumps and general noise, all of which needed to be compensated for in software which in turn slowed down the responsiveness of the controller. All of this was changed in the new version. The new Slidepipe does the ADC near the pipeheads, giving the sensor lines less than two feet to travel. Each slide has its own circuitry to handle the ADC conversion and manage the pipeheads, and acts as a slave device to the master. When the master requests the current state of its sensors, the slave replies. a Sharp IR Ranger to determine the distance of the paddle. The boards use the i2c protocol for communicating with the master device, and features an In-Circuit Serial Programming circuit for programming the microcontrollers. The master device has a fairly simple operation. It reads the state of the pedals, and requests the sensor data from the individual slave devices storing the results in memory. It then formats the data in OpenSoundControl (OSC) packets, and transmits those packets to the host computer over ethernet. The master device also takes care of calibration and initialization of the controller. When the pedals are pressed on startup, it will enter a calibration mode allowing the performer to tune the sensors to the environment they are performing in. The host computer uses Max/MSP to generate the sound, but since OSC has a fairly widespread implemention, it can be used with almost any performance software. Mark Argo is new media artist, musician and technophile. He has been exploring the dynamic representation of information and the creation of art through technology since 1998. This has taken the form of screen based compositions and animations; musical instruments and sound installations; and physical computing objects. Mark is currently completing studies for a Masters Degree at New York University's prestigious Interactive Telecommunications Program. There he has collaborated with Ahmi Wolf on several projects, including 'The Bass-Station' a portable, wireless network, which was exhibited at SIGGRAPH 2003 and featured in Linux Journal (Sept. 2003). 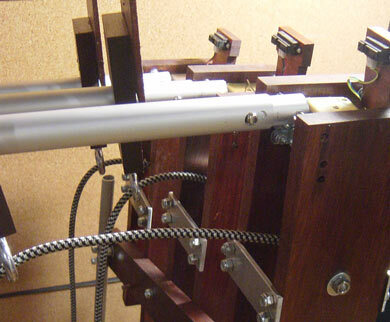 'The Slidepipe', a musical instrument created by Mark for resampling bluegrass music, was exhibited at NIME 2003 and performed in the Placard Experimental Music Festival in NYC. Mark has taught Interactive Design at York University in Toronto, and has given guest lectures at the Canadian Film Centre on Contemporary Internet Design. He was a finalist in the 2001 International Browserday Competition for his project 'Tap', which received critical mention in the New York Times. He is the founder of 'theraputik.com' and the former 'audio-therapy.com', both focusing on the intersection of art and human response.